The drama program of Russia’sthree-week-long, trendsetting, arts extravaganza opened on the first weekend of March this year. The Golden Mask is the most prestigious event of Russia’s art season. It is the principal theatre festival in Russia, as well as the main award in Russian theatre. Together, the festival and the award bring together the best performances from around the country, with foreign shows presented as part of the non-competition program. The Golden Mask Festival starts with the off-beat: in late February, Moscow features ballet and musical shows from the non-competition program. In March, the festival’s main feature – the drama program – begins. The drama segmentincludes two elements – the competition program and the New Play program. This annual selection of plays is the successor of the New Drama festival, which used to be a separate event. In the competition program, both classical and modern plays are invited to compete.The New Play program, however, is for the latest productions only; many of them are finalized just a few days before, based on the most recent scripts. This year’s program features a number of plays based on documentary material, and many of these are produced by directors from the Russian provinces. Roman Feodoridi’s “Right Bank Teenagers,” a production by the Krasnoyarsk Drama Theatre, is based on interviews (conducted by the director’s team) with disadvantaged teenagers from a criminal neighborhood. “Songs of Our Prison,” by Moscow’s Theatre.Doc, is a somewhat similar play produced by a group of directors and based on materials collected during visits to penal institutions. “Our Class,” from Warsaw-based TeatrnaWoli and produced by OndrejSpišák,is based on a sensational play by TadeuszSłobodzianek. The latter tells the story of the inhabitants of a small Polish town called Jedwabne; before World War II, about half the town’s residents were Jewish, but the Poles burned many of their Jewish neighbors as the Nazis approached. “Our Class” is also based on the real story gleaned from archive materials used by Słobodzianek. The Spišákproduction tells the story of the pogrom itself, and how the Polish people live with this gruesome experience. In a different approach, director Konstantin Bogomolov takes a completely realistic story and turns it into a production that seems more like a severe exercise in absurdism than a play. 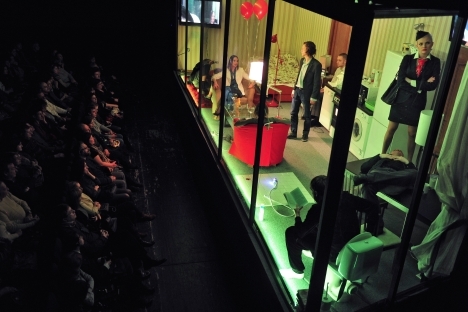 The play “Stavanger,” based on the writing of Maria Krapivina, finds all of the actors stuck in a cramped, hermitically sealed, aquarium-like room as a stage. In Krapivina’s story, a woman tired of financial hardships at home decides to moves to Latvia to try to find happiness there; however, she finds herself unable to get used to new people and a new way a life, and she returns home. Bogomolov’s play, produced by the Liepaja Drama Theatre of Latvia, places the heroine’s interactions and experiences in a foreign land under a figurative and literal magnifying glass for audiences. Still other authors of plays presented at the New Play festival seem to be looking for a hero of our time. The play “Kedy,” by Lyubov Strizhak at the ON.Theatre in St. Petersburg, focuses on a hipster — a representative of the apolitical young generation that replaced the generation of social climbers of the 2000s. The play describes one day in the life of a young music fan who spends his days partying. He never does buy a pair of new Keds, but he does get drawn into a vortex of events that took place in Moscow in the spring of 2012. Russian theatre has been experiencing a sort of changing of the guards this year: the main categories feature writers and directors who made their debuts three of four years ago in the Experimental category, in a special framework for non-format young theatre. “Two in Your House,”a Theatre.Doc production by Mikhail Ugarov and Talgat Batalov, tells the story of the relationship between Belarusian KGB agents and the family of presidential candidate Andrei Sannikov during his house arrest. The play is up for the best small-scale production award against the play “A Bad Girl,” which is produced by young Moscow director Dmitry Volkostrelov and based on the play by Belarusian playwright Pavel Pryazhko. Dmitry Krymov’s“Gorki-10” is a historical farce based on the materials of Soviet revolutionary kitsch — the productions by the designer and director are dubbed “scenography theatre,” as the setting, symbols and constructions are always front-and-center in their plays. “Occupation is Nice,” from the theatre OKOLO, also refers to the past. It is based on Tatyana Yegorova’s play, recalling the everyday life and views of the Soviet soldiers who served in the Group of Soviet Forces in Germany. “The Year When I Wasn’t Born,” by Konstantin Bogomolov, is competing for the best large-scale production award. Bogomolov’s production is the story of a child born in the middle of the 1970s and the hopes and disillusionment he had — along with those of the entire country. Competing with Bogomolov are two German directors working in Russian. Thomas Ostermeier is a resident of the Schaubühne Theatre in Berlin who produced “Miss Julie.” Ostermeier’s play is based on another by August Strindberg of the Moscow Theatre of Nations, and it stars Yevgeny Mironov, Chulpan Khamatova and Yulia Peresild. The other German director is Matthias Langhoff , who produced “Sophocles. Oedipus.Tyrant” in the Saratov-based Youth Theatre. The award category for experimental productions will be particularly exciting this year. Theatre.Doc presents its political farce “Berlusputin” — a bitterly funny production based on the play by Nobel Prize winner Dario Fo, “The Two-headed Anomaly.” The play has already been awarded for its street performance; last May, a shortened version was performed in the protest camp of the opposition Occupy Abai. The utterly authentic “The Uzbek” is also up for the award. It is a one-man show by Talgat Batalov, produced in the Joseph Beuys Theatre. In the play, the author shares the story of his assimilation in Russia. Other nominations in the category include the saturated visual and dramatic performance of “The Full Moon” by Filipp Grigoryan, as well as “A Story of a Soldier,” produced at Paltforma by the dancing group Tsekh and the Dutch dancing company Club Guy and Roni. It is a cross-genre production,combining the music of Stravinsky (rearranged by Aleksei Sysoyev) with text by Yekaterina Bondarenko that tells the story of a soldier who comes back home from war to the present day. Of course, the festivities are not all for Russian-language productions, as several mini-festivals will run parallel to the Golden Mask Festival. For instance, the Mask Plus festival, which brings in shows from around the world as well, will begin shortly after the New Play program, on Mar. 10. This year, according to John Freedman of The Moscow Times, the Mask Plus will feature eight productions by various theatres from all corners of Russia, as well as productions from the U.S.-based Double Edge Theatre in Ashfield, Mass. and the Klockrike Theatrein Helsinki, Finland; both of the latter shows reportedly have close ties to Russian theatre. On Mar. 17, Double Edge will presentfor the festival its production, "The Grand Parade," at the Meyerhold Center. Freedman writes that the play was inspired by the paintings of Marc Chagall and premiered just a month ago at the Arena Stage in Washington, D.C. Original music for the highly physical piece, which includes aerial acrobatics and more, was written by the Russian composer Alexander Bakshi. Finally, Klockrike Theatre will offer a rendition of Anton Chekhov's "Uncle Vanya" at the festival. The production is being staged by the prominent Ukrainian/Russian director Andrey Zholdak at the Meyerhold Center on Mar. 27 and 28.